The 2019 CEF Energy call virtual Info Day took place on Wednesday 10 April 2019 and covered the priorities of the 2019 CEF Energy Call open since 20 March 2019. The event was webstreamed and recording of the event will be available for 2 years under the link: https://webcast.ec.europa.eu/2019-cef-energy-virtual-info-day-10-04-19. In case you experience problems watching the recording please use the browser Chrome. 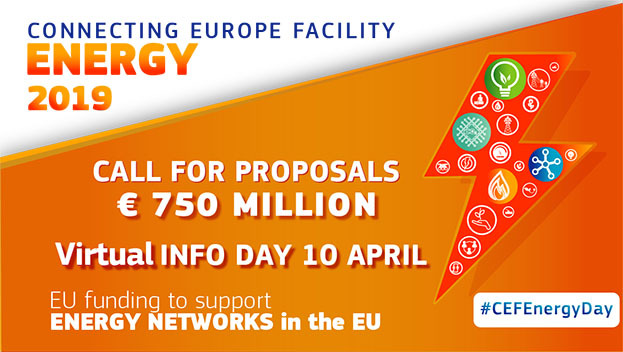 The Info Day also offered the opportunity to ask questions related to the 2019 call to Commission and Agency staff members via email to INEA-CEF-Energy-Infoday@ec.europa.eu and on Twitter using the hashtag #CEFEnergyDay. Questions received during the event were answered immediately, and written replies will be available on the FAQ page after the event. If you do not find an answer on this page, please contact the call helpdesk: INEA-CEF-Energy-calls@ec.europa.eu before 30 May 2019. The event was live tweeted with the hashtag #CEFEnergyDay. Follow us @inea_eu in order to receive all up-to-date news relating to this call. Don't forget to fill in the survey after the event - it will only take you two minutes and will help us improve next time.